Nature has many versions of Caller ID spoofing, one of which is most familiar to dog owners. 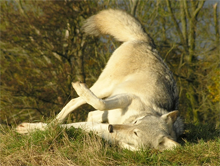 Pictured is Duma, a wolf at the UK Wolf Conservation Trust, as she rolls to capture a scent atop a mound. She's rolling on some aftershave sprinkled on the ground a few minutes earlier. Scent-rolling is believed to be a method for disguising the individual's own scent, as a means of avoiding detection by prey. It provides olfactory camouflage. Photo (cc) Retron courtesy Wikipedia. Last time we looked at deceptions involved in faking calls, circumventing personal cell phone bans, and borrowing phones. Here is Part II of our catalog of telephonic deceptions. In these days of frequently broken cellular connections, we've all become accustomed to interrupted conversations. Usually, broken connections are due to malfunctions. But some people have taken advantage of the situation by actually terminating calls they no longer wish to continue. To avoid paying a social price if they do it angrily, they break the connection while they themselves are speaking calmly, as if engaged in the conversation. Their conversation partners then assume that the broken connection is a mishap, but the conversation breakers don't renew the connection, and they don't pick up if their partners try to renew. Common mistakes: breaking the connection while the other person is speaking, or breaking it while audibly angry. Background sounds might not be what they seem. You can buy recordings of background sounds from airports, train stations, busy streets, traffic jams, sports events, arguing kids, and more. There are even apps for recording your own custom background sounds, to ensure, for example, that flight number announcements match what they are supposed to be, or that the arguing kids are actually your kids. Common mistakes: re-using a recorded background sound once too often with the same person, or using a busy airport background when the airport in question is actually closed by weather or mishap. be what they seemwas the key technique used by the hackers working for News of the World. Using a paid service, the call initiator provides two phone numbers — the number to call, and the spoofed caller ID. The service then places the call to the first number in such a manner that it appears to have been originated from the second. This deception can make a call appear to come from a phone different from the originator's phone. Thus, for example, the originator can appear to be calling from work when actually calling from his or her mobile phone. If the originator's work phone is forwarded to his or her mobile phone, not even an immediate callback will unwrap the deception. Common mistake: failing to control the background sounds of the originator's location well enough to match the location of the spoofed phone. Would you like to see your comments posted here? rbrenNqUBqyGjoGvfGUIBner@ChacwMhKtRCbRybmJgUaoCanyon.comSend me your comments by email, or by Web form. I offer email and telephone coaching at both corporate and individual rates. Contact Rick for details at rbrenJMOZfmzjRIFDqxgtner@ChacSNlyADMXZSWAnznFoCanyon.com or (650) 787-6475, or toll-free in the continental US at (866) 378-5470.